An average of 18 US military veterans are taking their lives every day as the Obama administration and the Pentagon grow increasingly defensive about the epidemic of suicides driven by Washington’s wars of aggression. The stunning figure was reported last week by the Army Times, citing officials in the US Veterans Affairs Department. The department estimates that there are 950 suicide attempts every month by veterans who are receiving treatment from the department. Of these, 7 percent succeed in taking their own lives, while 11 percent try to kill themselves again within nine months. The greatest growth in suicides has taken place among veterans returning from the wars in Iraq and Afghanistan, who accounted for 1,868 suicide attempts in fiscal 2009, which ended on September 30. Of these, nearly 100 succeeded in killing themselves. The connection between the “surge” in military suicides and the ongoing wars in Iraq and Afghanistan is undeniable. The suicide rate within the military doubled between 2001 and 2006, even as it remained flat among the comparable (adjusted for age and gender) civilian population. And the numbers continue to rise steadily. 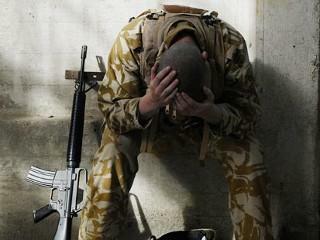 In 2009, 160 active-duty military personnel killed themselves, compared to 140 in 2008 and 77 in 2003. Many have blamed the increasing number of suicides on the repeated combat deployments to which members of the all-volunteer US military are subjected, with the so-called “war on terrorism” approaching its 10th year and nearly 200,000 US troops deployed in Afghanistan and Iraq. The effect of the repeated deployments is compounded by the shortness of so-called “dwell time”—the interlude at home bases between combat tours in Iraq and Afghanistan. Over most of the two wars, this has been limited to just one year because of personnel pressures. While it is now closer to two years, psychological research has indicated that at least three years are necessary to ameliorate the psychological stress inflicted by these deployments. The military command has tried to obscure the connection. Last month, for example, the Army’s surgeon general, Lt. Gen. Eric Schoomaker, told a Senate committee that the most common factor in military suicides was “fractured relationships of some sort.” Clearly, however, the multiple deployments and the psychological impact that they have upon soldiers is the leading cause of broken marriages and mental health problems that lead to the breaking off of relationships. Craig Bryan, a former Air Force officer and University of Texas psychologist who advises the Pentagon on suicides, linked the phenomenon to the training given by the military itself. “We train our warriors to use controlled violence and aggression, to suppress strong emotional reactions in the face of adversity, to tolerate physical and emotional pain and to overcome the fear of injury and death,” he told Timemagazine earlier this month. These qualities, designed to prepare soldiers to kill unquestioningly, “are also associated with increased risk for suicide,” he said. He added that these psychological traits cannot be altered “without negatively affecting the fighting capability of our military.” To put it bluntly, suicide, according to Bryan, is an occupational hazard. “Service members are, simply put, more capable of killing themselves by sheer consequence of their professional training,” he said. The same training, combined with traumatic experiences in Iraq and Afghanistan, has created severe difficulties for many veterans of the two wars trying to re-integrate themselves into civilian society. While the suicides are the most glaring and tragic indicator of these problems, there are many others. Last month, the jobless rate for veterans of Iraq and Afghanistan reached 14.7 percent, nearly 50 percent higher than the official nationwide unemployment rate in the US. According to one recent Veterans Administration estimate, 154,000 US veterans are homeless on any given night, many of them living on the streets. Increasingly, the ranks of this homeless army are being swelled by those returning from Iraq and Afghanistan. According to a report in the Military Times last month, one in six members of the US military is using some form of psychotropic drug, while 15 percent of soldiers admitted to abusing prescription drugs over the previous month. Soldiers interviewed in the article said that they were given pain pills to which they became addicted as well as sleeping pills and other medication, while alcohol and heroin were readily available in their barracks. Little or no therapy was on offer, however. At least four soldiers sent to the unit at Fort Carson have committed suicide there since 2007. On April 16, Veterans Affairs Secretary Eric Shinseki, the former Army chief of staff, testified on Capitol Hill on veteran suicides, providing equally telling numbers. He reported that VA suicide hotlines were fielding 10,000 calls a month.